Noël Coward uses a well-to-do family as a microcosm in this look at British life down the years, from the Boer War to the Great Depression. Critics at the time loved this rather sanctimonious jaunt through history. Seen from the vantage point of post-Second World War egalitarianism, however, it all appears quaint and riddled with accepted class differences. 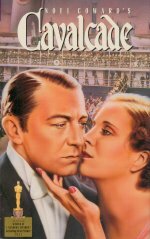 While Coward, via director Frank Lloyd, pulls out all the Rule Britannia stops, a modern audience will remain resolutely dry-eyed. Still, it's an interesting period piece.